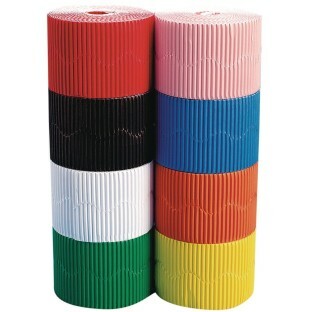 Each colorful roll measures 2-1/4"Wx50'L. Corrugated paper borders in 8 bright, fun colors. Ready to use and a perfect size for bulletin boards, window or desk trim, craft projects and many more decoration ideas. Each colorful roll measures 2-1/4"Wx50'L. I was surprised at how much I had even when I thought I ran out I had more. I was very happy with this item. Thiis item was very versatile. This item was not only used for bulletin boards but also for a door decorating contest. It was strong enough to withstand the rough handling by teenagers. The white border was used as hills of snow. Used this for the bulletin boards in my classroom. The color is beautiful and the quality is great!